Apart from 2 regular flavours Vanilla & Strawbery, we also have Black current. 3 mouth-watering flavors are Strawberry, Butterscotch 7 the very irresistable – Chocolate. 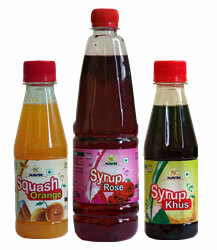 Rose syrup & Khus syrup, the ultimate coolers. Citrusy, fruity & fresh- Orange squash & Lemon squash.